"1950s Historical ETA" Mark Lee Pringle performing with the 1950s Blue Moon Band. Photo Credit: Del Piper. I am pleased to introduce ETA Mark Lee Pringle to SIDEBURNS followers. As an ETA, Mark sets himself apart from other ETAs by focusing exclusively on Elvis Presley in the early years of his career. 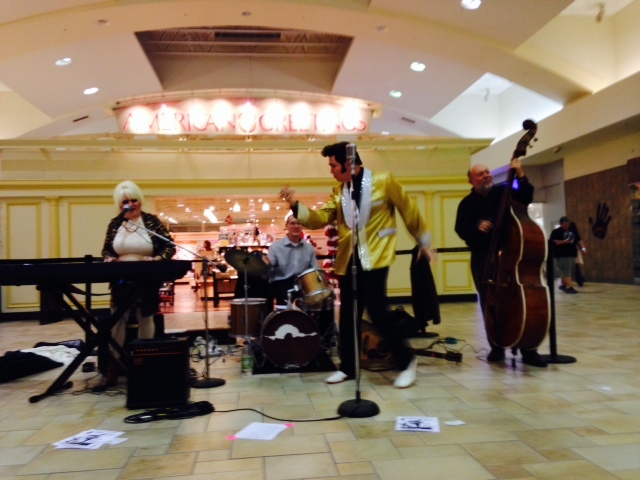 Mark's passion for Elvis in the 1950s goes beyond performing his songs. At the end of his bio and photos I have provided additional information about Mark and his amazing collection and creations. I'm from Girard, Ohio, and I've been an Elvis fan since the age of 3!! I've always loved his music and movies from all eras...but the time-period that really 'got me’ was the 1950s! ETA Mark Lee Pringle performs at the Southern Park Mall dance. Photo Credit: Adam Desantis. Well, I didn't give it much thought at first, because the fellas that were paying tribute to him back then were all 1970s era--gold sunglasses and white jumpsuits, and I couldn't see myself doing that portrayal. I kicked the idea around a few months and thought, "I'll do 1950s Elvis!” (Not many people were doing the 50s back then, 17 years ago). So I started studying and researching everything I could get my hands on from his 50s career!! When I perform with my live band, we do the same song sets, in order, like Elvis did from 1954 to 1957, and I tell trivia and historic facts about the songs and time period. ETA Mark Lee Pringle performs at the Grand Opening of a Harley-Davidson store. Photo Credit: Brenda Pringle. I used to compete when I first started, for the first 6 years, and came in 1st and 2nd place in many different contests from Cleveland to Memphis; but now I just focus on keeping my tribute as detailed as possible. My wife, Brenda Pringle, plays piano and guitar, my son Scot Pringle plays drums, and my good friend, Bill Lewis, plays stand-up bass in our band. I have a blast doing what I do, and it's an honor to pay tribute to Mr. Presley. I have been very blessed! I wish to thank ETA Mark Lee Pringle for sending along his bio and photos to post on SIDEBURNS Magazine. Mark has such an interesting Facebook page. Mark, a collector of 1950s Elvis memorabilia, makes most of his own 1950s Elvis costumes which he shares in photos on his Facebook page. Mark recently made a jacket like the one DIG Magazine gave Elvis in 1956 at his first Las Vegas appearance by reconstructing a beige jacket and hand drawing the DIG logo on the back of the jacket with permanent fabric markers. Mark's 1955 belted jacket, like the one Elvis wore at Ellis Auditorium, was crafted from three other jackets. Mark exhibits great artistic talent in the costumes he makes, and his knowledge of all things early Elvis is remarkable. * When I asked Mark about his costumes and collection, his response was, “I make/craft about 80% of my outfits. I try my best to make them as historically correct to what Elvis actually wore from 1954 to 1958. I collect only 1950’s items…either outfits, guitars, or items like he had at Audubon Drive or SUN Studio (Memphis Recording Service). Pics of all of these items are also on my Replicas and Gear page." *Mark shares very interesting background stories that explain the costumes in the photos. Mark also recently posted some delightful photos and videos that celebrate Chinese New Year. Mark Lee Pringle--an ETA with many interests and talents! Best regards, Carolyn.